This is always a good time of year to enjoy watching gannets (and indeed porpoises, who often feed in the same areas). Ramsey has some impressive seabird colonies – razorbills, guillemots, fulmars and some kittiwakes – but nothing on the scale of Grassholm with its gannets. The birds famously cover a large portion of the island, giving it a snow-capped look and a rather distinctive smell, which travels some considerable distance on a sunny day with the wind behind it 🙂 . 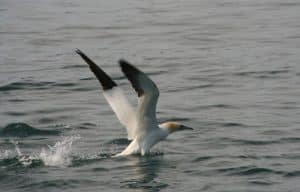 When sea conditions are good we head offshore to visit the gannets and look for dolphins but we also have the benefit of gannets visiting us in Ramsey Sound. They come to feed on the south going ebb tide and their fishing exploits can be quite something to watch.